Information provided by OEP Director Mary Jones. 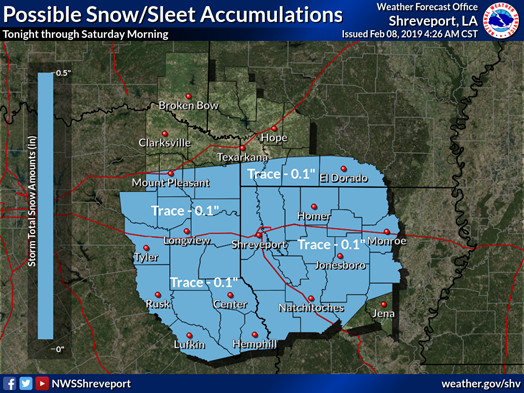 A light mix of rain, sleet, and snow is possible beginning this evening across portions of East Texas and then spreading east-northeast into Northern Louisiana and Southern Arkansas. Rain will develop by late this afternoon across Central and East Texas. As temperatures fall after sunset, the rain will likely transition into a light wintry mix of rain, sleet, and snow as it spreads northeast into Northeast Texas and portions of Southern Arkansas and Northern Louisiana. The precipitation should end around sunrise Saturday morning. Temperatures will warm back into the 40s during the day Saturday, so any accumulations that occur will melt.